Of all the MRSA precautions to prevent infections, cleaning, sanitizing and disinfecting are three of the most important. But while bleach and many commercial disinfectants are effective against MRSA Staph, they also contain toxic chemicals which can weaken your natural defense system, making you more vulnerable to infections in the long run. Therefore, it’s important to use these products carefully, or better yet, switch to the safer alternatives at the bottom of this page. Disinfectants are meant to kill or destroy bacteria like MRSA and Staph, and bleach is a well-known example. In contrast, a sanitizing agent will only reduce the number of bacteria, but not kill them all. Alcohol gels and hand sprays are common skin sanitizers. 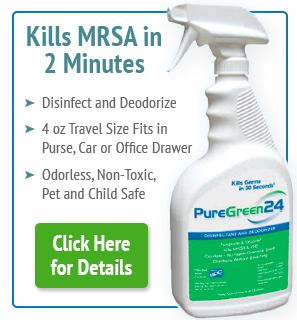 Below are tips on disinfectants that kill MRSA and how to use them for proper MRSA cleaning. Bleach must be diluted in water to kill bacteria, and it must be made fresh each time. Bleach (or sodium hypochlorite solution) is often recommended by doctors as a good universal disinfectant. While this potent agent can kill many germs, including MRSA and Staph, it has to be used properly and at the correct dilution to work well. Be aware that this common household solution has serious health, safety and environmental issues to be aware of. Does bleach kill MRSA and Staph? Yes it can, but it must be made fresh and with the correct dilution following the manufacturer’s directions. To be effective, bleach MUST be mixed with water first. Using it straight or undiluted is actually less harmful to germs than diluting in water. A 10% solution is generally best for disinfection, however different brands of bleach can have dilutions for their product. A 10% solution means 1 part bleach to 9 parts water. Refer to the product label or company website for the specific “kill times” for MRSA or Staph aureus. For example, you’ll see for this Clorox product, that both “Staph aureus” and MRSA are listed with a kill time of 5 minutes. This means this specific product will kill Staph or MRSA and the product must remain wet on the area you are disinfecting for 5 minutes to be effective. 10% bleach is less corrosive and less hazardous than the undiluted form. Most sodium hypochlorite solutions are not compatible with metal surfaces and produce toxic compounds if mixed with most other cleaning agents. Because it is caustic, corrosive and pollutes the environment with dangerous dioxins1, be sure to follow the listed use and safety precautions, wear gloves, and have very good airflow during use. Because bleach is toxic and it can be inhaled and absorbed through the skin, it’s best to use this product as little as possible and substitute safer options whenever possible (see further below for details). Does Lysol kill MRSA or Staph? While some of their products will eradicate MRSA, many will not. There are several other household chemical disinfectants, including Lysol and Pine-Sol that have also been used for killing MRSA. Many will kill Staph aureus bacteria, but there are many versions of these products and not all have stated kill times for the bacteria on the bottle label. Therefore, review the product label or the product website for the specific product you are wanting to use. Look for stated kill times for either Staph aureus or MRSA to ensure they will work. Because of inherent toxicity and safety issues with these phenolic disinfectants, it’s best to minimize their use or substitute safer options (see further below). First clean the surfaces you intend to disinfect to remove scum and dirt. Dirt and grime on surfaces will reduce the effectiveness of any disinfectant. Read the product label to see what germs it is effective against. Some disinfectants list MRSA specifically on the label, but most just list Staph aureus. If it destroys “Staphylococcus aureus”, it should also work for MRSA, though it may take longer contact times. You can also refer to the product’s website for directions for use for controlling bacteria. Wear gloves, protective clothing and use good ventilation. Disinfectants are meant for use on surfaces, not on people. These products are generally not safe to breath or get on your skin. Focus your disinfecting efforts on high-touch surfaces. Staph and MRSA bacteria love people’s skin, so they hang out on “high-touch” areas and spread by people’s hands. Devices like remote controls, keyboards, game consoles and phones (be sure to follow manufacturer cleaning directions, especially for electronics). As for how often to disinfect, areas of high traffic with lots of people may need daily attention. Lower traffic areas can usually be disinfected less often, such as once or twice per week. Deciding how often can be a balancing act between effective bacterial control and exposure to toxic cleaning products. Using harsh and toxic products too often can cause more harm than good to your body’s natural defenses. Nobody wants MRSA or Staph wandering around their home or office, but many people don’t think twice about using toxic and poisonous compounds to clean with. Children and pets also come into contact with these cleaner residues left on floors and other home surfaces. The EPA actually advises using only nontoxic, unscented cleaning products, which are often just as powerful at killing MRSA, but without all the health and environmental risks. Unfortunately, you won’t hear many toxicity warnings from the CDC on disinfectants2, but most commercially available chemical brands contain poisonous chemicals which are harmful to your health when absorbed into your body (through your skin or by inhaling it). As mentioned above, commercial disinfectants contain many toxins like dioxins in bleach which according to the World Health Organization cause immune system damage3. These toxins can pose a health threat to your lungs, skin, may be carcinogenic, and they pose a threat to the environment too. Many cleaners also contain phenol and cresol, which if ingested, can cause diarrhea, fainting, dizziness and kidney or liver damage. They may also contain formaldehyde, a suspected human carcinogen that can irritate your eyes, throat, skin and lungs. When these toxins are touched or inhaled they can accumulate inside your body. This creates a toxic burden which weakens your immune system, making it harder to fight off infections. To see how your favorite cleaner rates, the Environmental Working Group has a great resource on safety of cleansers and disinfectants here4. Effective MRSA and Staph prevention and control includes keeping contaminated areas in your home clean with non-toxic cleaners, good hand washing methods with natural soap, as well as control of airborne bacteria, particularly if someone in your home is infected or is a MRSA or Staph carrier. Luckily, there are safer alternatives you can either buy or make yourself for sanitizing or disinfecting. Many are made with natural antibacterial agents like essential oils of thyme or oregano, silver or hydrogen peroxide. Keep in mind, commercial products should have kill times for MRSA or Staph. For any product you make yourself, there will not be a guaranteed kill time. Concentrated Hydrogen Peroxide disinfectants (this is not the 3% solution you use for cuts and scrapes). Concentrated hydrogen peroxide should have no odor and it break down into water and oxygen. It should still be used with caution as this concentrated form can cause skin burns. Thyme essential oil has been shown in numerous studies to be effective against Staph aureus bacteria. The same goes for oregano essential oil and many other essential oils. 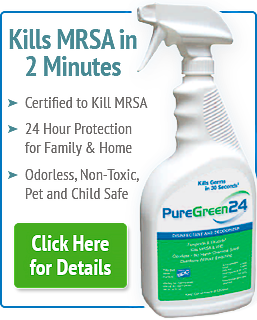 Some commercial disinfectants like Seventh Generation are using them. You can also make your own cleaners. See some of Michelle’s favorite essential oils for cleaning here. Silver ion products are also effective against MRSA and Staph. Some silver commercial disinfectants also have stated kill times for MRSA. While vinegar is a great natural cleaning agent you can add to your cleaning supplies, Michelle would consider it only a mild sanitizer for Staph aureus and MRSA. Vinegar works well as a sanitizer (not disinfectant) against Salmonella and Pseudomonas bacteria5. These options are much safer for you, your children and your pets. Using safer cleansers will help keep your body healthier by reducing your exposure to toxins. Safe and effective natural ways to clean, kill and control MRSA are covered in the Program MRSA Secrets Revealed. Also included are recipes for safe sanitizers and hand sprays using essential oils, plus in depth coverage of prevention techniques. Carrier FAQ’s: What’s a Staph or MRSA carrier?